Campaigners of AIDS Access Foundation of Thailand submitted petitions against the evergreening application of sofosbuvir drug at Department of Intellectual Property in Bangkok on 11 April 2017. Sitting on the right is Chalermsak of the foundation. They are also worried about a recent move by the current military government to exercise a special power to speed up the processing of the current huge backlog of patent applications, which they believe could benefit those alleged unmerited applications. The tactics known as evergreening are the process of using arguments that may not be justified for keeping patents fresh, which translates into pharmaceutical companies continuing to make exorbitant profits at the expense of patients. Tactics employed in evergreening could include a new combination of drugs, a slight different composition of drugs, or a different method of taking the drug, which critics say does not constitute a new innovation warranting the award of a new patent. “Evergreening in medicine patents has been a problem in Thailand for a long time,” Chalermsak Kittitrakul, coordinator for access to medicines campaign at AIDS Access Foundation in Thailand, told Intellectual Property Watch. “It is the cause of substandard patents and unwarranted monopoly in many vital drugs,” Chalermsak said. Rachod Thakolsri, secretary general of Thai Pharmaceutical Manufacturers Association, agreed that multinational drug companies have been using evergreening in pre-empting production of generic drugs by local companies. Rachod, who is also the managing director of Biolab, a local drug manufacturer, attributed the problem to drug patent officials at Thailand’s Department of Intellectual Property (DIP). “I think that until these days, the department still doesn’t have any pharmacist who is really knowledgeable about pharmaceutical matters,” he said. He said this has resulted in sometimes broad and vague terms of patents granted to foreign manufacturers, making it harder for local manufacturers to come up with generic versions of the drugs. The study says Thailand would have saved at least 8,000 million baht (about US$258 million) if those patents were not granted. The study cites as an example of the effect on high prices by the evergreening of the drug atazanavir, which is recommended by World Health Organization as a component of second-line antiretroviral treatment regimens for adults living with HIV. Two patents on this drug are expiring soon, but there are four more enforceable patents, with the latest not due to expire until 2028. This causes prices to be as high as US$240 per patient per month, compared to US$33 to US$46 for the generic version produced in India. 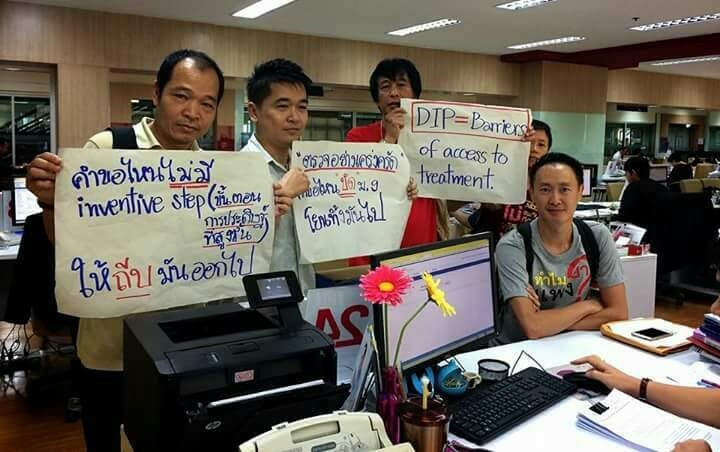 AIDS Access Foundation, which is active in campaigning for free or affordable drugs for HIV or AIDS patients in Thailand, has been petitioning against what it sees as evergreening applications by transnational pharmaceutical companies. Since 2015, the organisation has filed nine such opposing petitions with Thailand’s DIP. Its latest filing in April 2018 was involved with hepatitis C treatment drugs, known by their generic names as sofosbuvir + ledipasvir, arguing that the application was about a treatment, which is non-patentable, and was simply about mixing two medicines with no innovation. Chalermsak of the AIDS Access Foundation said all of the nine opposing petitions remain under consideration by DIP. “If any one of these standards is not met, then the patent will not be granted,” the PReMA statement said. It did not refer to any evergreening of drug patents. Meanwhile, due to the current large backlog of patent applications, the military government has mulled over exercising a special power to expedite the approval of those applications, a move that has been opposed strongly by local and international civil organisations as it could benefit evergreening patents. As of 2016, the latest statistics provided by DIP, there were 12,743 patent applications pending approval, of which 4,664, or 36.6 percent, belong to Thai applicants and 8,079, or 63.4 percent, are of foreigners. Of the total applications, 7,820, or 61.4 percent, are applications for invention patents, while the other 4,923, or 38.6 percent, are for design patents, according to statistics published on the department’s website. Of the invention applications, the number of foreign applicants is six times higher than that of their Thai counterparts. DIP does not say how many of the applications for invention patents are for pharmaceuticals, but AIDS Access Foundation said about 3,000 of them are drug applications. Such a high number of pending applications has prompted Thailand’s current military junta to ponder exercising its special power to clear the backlog. The junta, known officially as the National Council for Peace and Order (NCPO), seized the power from an elected civilian government in a military coup in May 2014 and then installed a temporary Constitution of 2014, in which a provision known as Section 44 grants the junta leader, General Prayut Chan-ocha, concurrently the Prime Minister, a special power to exercise his authority in various matters in administering the country. Though Thailand now has a permanent Constitution of 2017, General Prayut, as the junta leader, maintains his power under this Section 44. He has implied the exercising of this provision to speed up the approval of patent applications. They said in the letter that it would result in “exorbitant prices, unaffordability, and inaccessibility” of essential medicines for patients. The letter argued that Thailand’s rate of patent approval was similar to other countries that implement pro-health intellectual property policies, like India and Brazil. Citing information from the World Intellectual Property Organization, the letter said that in 2014, Thailand saw filing of 7,930 applications for invention patents and 1,286 patents were granted. The rate of granted patents in Thailand was equal to 16 percent, compared to 13 percent and 11 percent in India and Brazil in 2015 respectively. The letter was signed by Make Medicines Affordable, a coalition of organisations working together to make essential HIV medicines more affordable to the people who need them, and 43 supporting organisations around the world. AIDS Access Foundation of Thailand was also one of the signatories. Chalermsak told Intellectual Property Watch that apart from delivering the letter to the Prime Minister, he and others have also met with government leaders to persuade them against exercising the Section 44 power. Therefore, such exercising of the power has been delayed, he said. In its statement, PReMA also addressed the issue of application backlog. “The average pendency for a biopharmaceutical patent application in Thailand is approximately 12 years,” it said. “With the recent increase in patent examiners, we believe that the Department of Intellectual Property is moving in the right direction to improve the backlog for the benefit of the country,” the statement said. Rachod of the Thai Pharmaceutical Manufacturers Association said he disagreed if the Section 44 would be exercised simply to speed up the approval of applications. He suggested the special power should be used to raise the efficiency of the approval process by restructuring its procedures and addressing the issue of inadequate staff number at the DIP. "Evergreened Patents Cause Unwarranted High Drug Prices, Hinder Growth Of Local Producers – NGOs, Thai Producers Claim" by Intellectual Property Watch is licensed under a Creative Commons Attribution-NonCommercial-ShareAlike 4.0 International License.